Did you know it I haven’t gotten as many of the new food polls up as I had hoped, but I have lots of ideas so I will be continuing it just may not be quite weekly. Since June is National Dairy Month, I thought I’d go with the theme and poll on something in that food group. But I already polled folks on ice cream, so I didn’t want to repeat that one. Seemed a perfect time to talk cheese! I really love cheese! Whether its a soft cheese like port salut or something like pepper jack or a harder cheese like parmesan. In the last few months, I had the chance to learn more about cheese. Where did this happen? 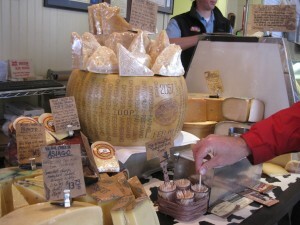 Well, I had a few chances to learn about cheesemaking when I did my Oregon-California Roadtrip! 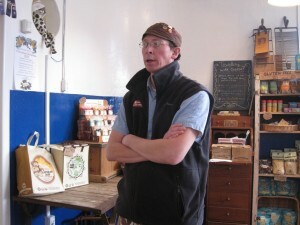 First on the cheese stops, was a chance to visit Rogue Creamery in Central Point, Oregon. 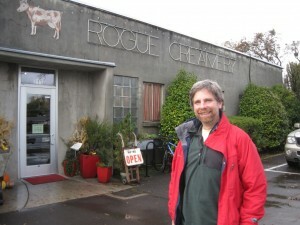 Rogue is famous for blue cheese and Steve thought I ought to check it out. He was right! We took time to talk cheese with the staff there and we had the chance to watch cheesemakers at work. The blue cheese reminded me that the good stuff stands on its own. I was so excited that I bought some blue cheese to take to my friends Jeff & Erin Fowle since they were my next stop. A week or so after I was in Oregon at Rogue, I was in the Hanford, California, home of my dear friend Dino Giacomazzi’s (aka @DairyDino) dairy farm. (I have to admit that before I visited dairy farms, I didn’t think too much about what a specific dairy farm. You know? 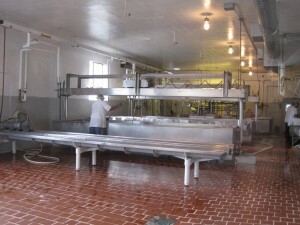 Then when I was at Ray Prock’s, he took me to Hillmar Cheese where his milk goes to be made into cheese.) Now I tend to ask whether the milk is destined for fluid milk, cheese or something else. Gotta keep pushing myself to learn more. We had the chance to talk about what Dino was doing that continued the families traditions as well make some advancements (he won this huge award called the Leopold Conservation Award). I had the chance to have lunch with Dino’s extended family. We had the chance to enjoy some great food and Dino told me about a gift of various products he gets for family at the holidays — various products from Land’o’Lakes since that’s who Dino sells the farm’s milk to. There were cheese snacks that would be perfect for me to have on the plane, some saute express cubes that were helpful and yummy when I got home & did a little cooking. But that wasn’t the only cheese that I left Dino’s with! I hadn’t met Barbara Borges-Martin (aka @dairygoddess) before, but having talked via social media for years, she was a dear friend. I had heard tales of her Dairy Goddess spreadable cheeses and even joined the gofundme effort to help DairyGoddess farmstead cheese expand her business. So when I knew I’d be in Barbara’s part of the country I was all about trying to figure out how to catch her at a farmers’ market, the farm or somewhere! Her schedule was nuts but she came to Dino’s for dinner…. armed with a selection of cheeses and chocolate milk! She makes lots of great cheeses, but I guess like everyone, there always seems to be a favorite. My favorite Dairy Goddess Cheese is the Azores…. Barbara makes it with roasted red pepper sauce made by the Dairy Goddess herself, with parsley, Portuguese style. I still dream about that one! There are so many great ones and Dairy Goddess cheeses are available at various Whole Foods, farmers’ markets and other stores. If you are ever in the San Joaquin Valley, you really should check it out! I’ve already highlighted several dairy farm blogs in the comments above, but I have lots of friends with dairy farms that weren’t along the drive from Portland to Fresno. 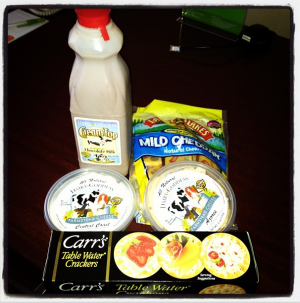 Carrie Mess aka @DairyCarrie who is a cheese lover extraordinaire. She spent a day making Sartorri Cheese last fall and I think she was in HEAVEN. She brought so much cheese to 140 conference that I had leftovers to enjoy for a LONG TIME! Dairy Discovery at SwissLane Farms: Annie Link (Michigan) — You may remember Annie best from the post about how to make maple syrup because I had a chance to visit her dairy farm. Dairy Innovation: Ashley Messing Kennedy (Michigan) — Ashley was the dairy farmer who invited me to Michigan in winter and got me to conquer that fear! I had the chance to participate in the Great Lakes Regional Dairy Conference asn well as to see my first ice sculpture contest! 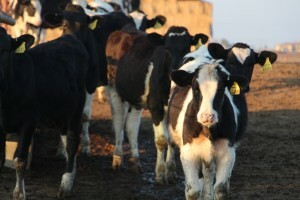 For the Luv of Dairy: Luv Hahn (Ohio) — I haven’t had a chance to visit Luv but we met at an AgChat Conference. 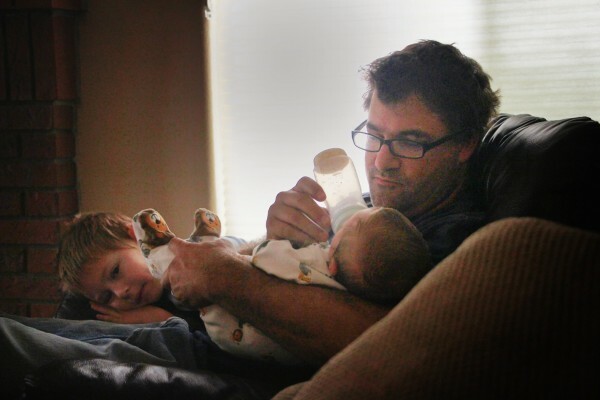 Hullmilk: Rob Hull and family (Idaho) — Never have met Rob but we’ve been tweeting each other for years! Silo Skies: Ryan Bright (Tennessee) But I think I may be a bigger fan of the blog his secret agent cows write when Ryan’s not looking. They crack me up with The Udder Side! And Ryan was nice enough to write me a guest post about how much he loves ol blue, his favorite cotton shirt! Spotted Cow Review: Susan Anglin (Arkansas) — Susan’s got a great rhythm to blogging & sharing her story. I met her a few years ago and I recently met her hubby while in DC. The Dairyman’s Blog: Will Gilmer (Alabama) — I have professed my love of Will’s videos so many times that I am sure people tire of it. Well, I don’t! Love his blog and videos! My fave is the one about hay season – The Baler Rolls – but the moo tube minutes teach me a lot too! The Dairy Mom: Brenda Hastings (Ohio) — I hope to see Brenda when I’m in Ohio later this summer! The Wife of a Dairyman: Nancy Grossi (California) — Nancy does a great job of talking about all areas of their farm, food, etc. She’s not from a farm background so she brings the perspective of new to dairy things like I do! Two Maids a Milking: Amy and Liz Kelsay (Indiana) — Liz is awesome! They have some cool things on the site about what the families are up to & what they are eating too! Zweber Family Farm News: Tim and Emily Zweber (Minnesota) — Tim and Emily have been social media friends so long that I have followed the birth of their kids and now watch them show cows! They provide recipes, farm info and all other kinds of things that are happening around their Twin Cities area farm. How will you celebrate national dairy month? It was great finally meeting you in the flesh! Great blog…sharing agriculture! Wishing everyone a very Happy June…it Dairy Month! Cheers to a big glass of cold milk and a yummy wedge of cheese! Thanks again for making the trek over…. I keep dreaming about Azores…. really wonder if I could con a friend into getting me some. It was so yummy!